Our students have been participating in an ongoing study of plants. Our outdoor garden has been a great source of interest for the students, especially the eggplants that are growing. These purple veggies have been the choice of study in Think Tank. This plant exploration has introduced the children to a variety of plants that several of them have never encountered before, such as leeks. It has also helped them understand how plants grow, as well as the physical attributes of each plant such as shape and size. Children discussed the science behind flowers/plants and have observed the growth process of the leeks, carrot tops and eggplant seeds. During the observation, the class noticed that the leeks had roots growing, while the eggplant seeds did not. Several of the students formed hypotheses to help explain why the plants might differ in such a way. One student mentioned it takes time for the eggplant to grow. Two other students also noted that the seeds do not have roots because they grow on trees. This plant exploration has been packed with variety of learning elements, making it a very valuable experience. Earth and Life Sciences were incorporated as the students studied the physical attributes, growth processes and natural environments of plants. Understanding scientific processes and using comparisons and observations about items to draw conclusions are all important scientific skills for children to master in order to have more meaningful learning experiences and interactions with the world around them. We incorporated literacy into this exploration by working on our writing skills. 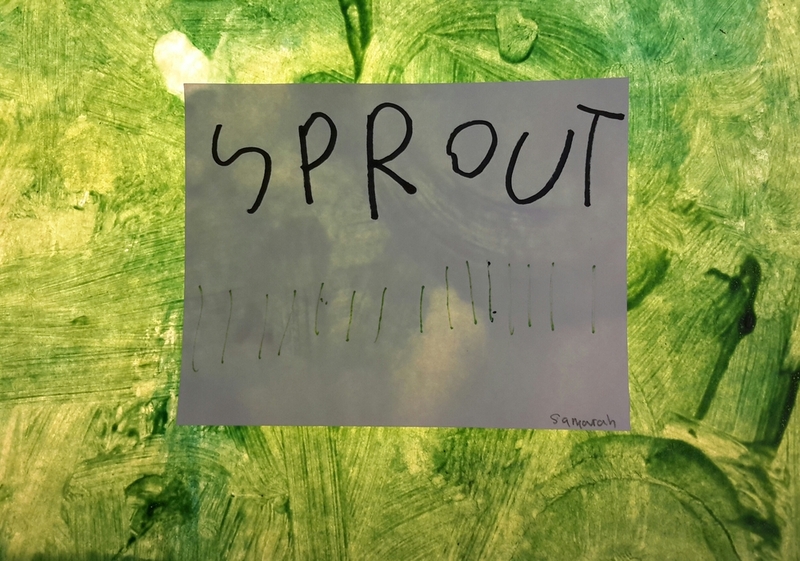 The children created sentences with the new words introduced such as sprout and soil. Writing, along with drawing, build upon fine motor skills and are both great tools for children to express their personal thoughts and ideas. The class was able to further their exploration by going outside, and as a group they were able to identify each plant. Working together to identify the plants and sharing their different opinions and explanations with one another allowed the children to foster positive relationships, build upon their interpersonal communication skills and participate in team building. The exploration built upon foundational aspects of cognitive development. The children obtained a greater understanding of cause-and-effect as they observed the relationship between caring for the garden and the growth of the plants. In discussing reasons why one plant might have different properties and growing processes from another, the children practiced problem solving. They built upon their classification and memory skills by noting different plant’s attributes and using their knowledge about each type to identify the plants in the garden. We will continue to observe the growth process of our plants in class.